You use your video surveillance software to monitor camera feeds, but who monitors your VMS? Investing thousands of dollars in a video management system only to have it fail when you need it most won’t happen with a program such as Video Insight’s Customer Assurance Plan (CAP). It’s 2 a.m. There’s a disturbance at your high school campus. Windows are broken, computers are stolen, and by the time the authorities arrive there’s no sign of the intruders. That’s okay. You’ll have video of the criminals. In fact, it’ll be crystal clear and irrefutable because you invested thousands of dollars in a high-tech IP video surveillance system. You have your system configured for weeks of storage and with cameras placed at every angle near the incident, you know you’ll have great images. Except…when you go to retrieve the video you discover that there is none. The server that all of your cameras link to in that section of the building shut down for a system update and never restarted. It’s not the VMS’s fault – it was working properly. It’s not the cameras’ fault – they worked, as well. To avoid this costly – and frustrating – scenario, invest in the ultimate in technical support with a Customer Assurance Plan (CAP) like the one pioneered by Video Insight. 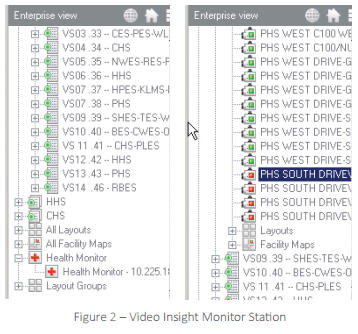 Video Insight developed a Customer Assurance Plan (CAP) that proactively monitors the status of your VMS – servers, cameras, connections – to ensure that you know when something isn’t working properly and you don’t find yourself in the high school scenario above. Of course a product like Video Insight comes with technical support for issues that arise that you are aware of and that are linked to the performance of the software. But, as an added feature, CAP provides a dedicated specialist whose priority it is to monitor the operation of your system to ensure it’s always working properly, and, if not, to diagnose the problem – when the system went down, whether it’s an issue such as a switch, power, etc. “A program like CAP is essential because number one it maintains the integrity of your system, but it also provides a level of support not available to many overtaxed or understaffed IT departments, particularly in industries such as school districts and colleges that continue to face serious budget issues,” said Nell. HEALTH MONITOR — The Health Monitor runs as a service in the background and monitors the receipt of messages from other Video Insight servers to ensure server uptime and reporting of any issues affecting the servers or cameras. The Health Monitor can be configured to send email alerts to the appropriate individual if messages from the servers are not received within the pre-determined time frame. Video Insight’s servers also send messages to the Health Monitor on camera operation and disk storage usage. 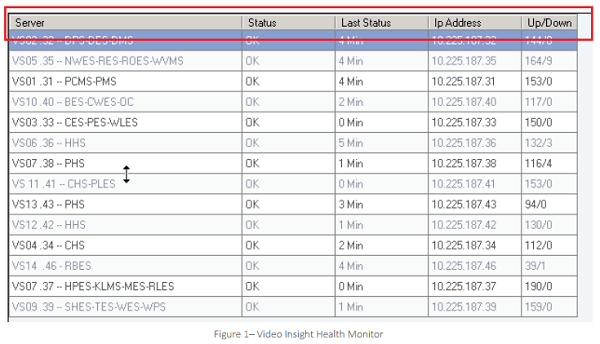 The Health Monitor (Figure 1) shows the Server, Status, Last Status, IP Address and cameras that are Up/Down. MONITOR STATION — The Monitor Station is the primary user interface in the Video Insight product suite. From an enduser perspective, it provides centralized viewing of live and recorded images from any server. System and security administrators use the Monitor Station to setup and configure all servers and cameras from a central location. With CAP, the Monitor Station also shows the status of servers that are active–indicated by a green dot (Figure 2). Inactive servers are reflected by a red dot. In the same figure, notice you can also view and access the Health Monitor indicated by a red cross. SERVER STATISTICS — The dedicated CAP specialist can also evaluate system status by viewing Server Statistics. Server Statistics provide vital information regarding the Server Status, Camera Status, Storage, Licensing and a list of current Online Users. 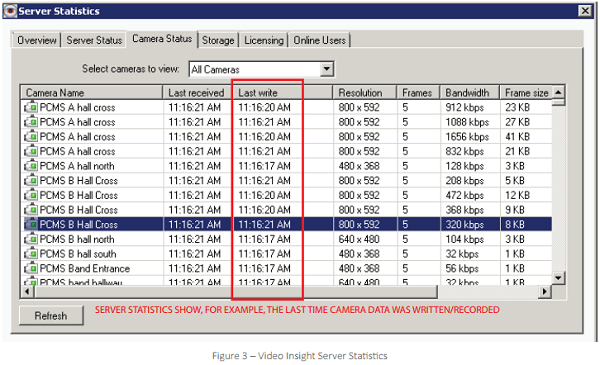 For example, the Server Statistics can tell you when data from the camera was last written, giving a true picture of how the cameras are working and what data has been saved (Figure 3, next page). An important element of Server Statistics is that it can be accessed from any machine that has the Video Insight Monitor Station installed. CAP-PLUS (OPTIONAL) — A proactive monitoring program such as CAP is a welcome service for those who – due to budget constraints or thinly spread IT professionals – don’t have the capability to ensure that the full functionality of their video management system is being properly monitored and delivered. But what happens when there is an issue that can’t be fixed remotely by your CAP specialist? In addition to CAP, Video Insight offers CAP-Plus, a service whereby Video Insight will deploy a technician – oftentimes consisting of a trusted partner systems integrator in the vicinity of the enduser – to make the necessary repair. Of course prior to a technician deployment, the Video Insight CAP specialist will make every effort to quickly resolve issues remotely first. If the issue is due to failed hardware, the technician will replace the hardware with a functioning unit provided the hardware was purchased from Video Insight and is under warranty during the time of the service call.